A Cook’s Warehouse now occupies the Ansley Mall space that once housed a Piccadilly. That just about encapsulates Atlanta’s culinary evolution. With her quick smile and easygoing demeanor, Mary Moore is the telegenic face of her company, often seen demonstrating products and techniques on CNN, PBS and local shows like Good Day Atlanta. Her experience as a hand model is just one item on a remarkably varied resume, which also includes an impressive cooking background achieved by the time she was in her 20s. She says she “basically cooked my way through Georgia State,” where she studied business and psychology. As busy as she remains with her stores in Midtown Atlanta, Decatur and Brookhaven, Moore is also actively involved with such organizations as the Metro Atlanta Chamber, the Atlanta Food Bank and Les Dames d’Escoffiers, an affiliation of female food professionals. She is first vice president of the organization’s international board. “It’s a wonderful group of supportive, inspirational women,” she says. Attractive and slender, inquisitive and wry, Dr. Gulshan Harjee wears her 58 years lightly. In a comfortable private practice in Decatur, she sits among family photos, recounting the moment she knew she wanted to be a physician – visiting the family doctor, at age 6 in her native Tanzania. “Everybody got a shot and pink medicine. You brought your own bottle, like this one,” she says, holding up a small glass vessel with a cork stopper. She shares experiences – and languages – with her patients, many of whom are immigrants and refugees who have landed in nearby Clarkston. Her languages reflect the breadth of her travels: Swahili, Gujarati, Urdu, Farsi and, of course, English. Despite her graceful mien, her past reflects an astonishing determination to overcome successive hardships, any one of which could have defined another life. At 16, as Uganda’s Idi Amin rose to power, eventually declaring war against Tanzania, Harjee left home, setting her sights on the best school in Pakistan. In what would become a habit, she went straight to the top, sitting in the principal’s office for three days before he finally granted her an audience – and admittance. When war with India threatened her schooling again, she applied to study medicine in nearby Iran, despite her lack of means, contacts or even language skills. Turmoil intervened once more, as the Iranian Revolution deposed the shah, and Harjee again faced finding another school, in another country, in another language. Now ready to join her Pakistani fiancé, who had emigrated to Atlanta to practice law, she focused on Morehouse’s medical program, and again contacted the top official – Dr. Louis Sullivan, later to become Secretary of Health and Human Services under President George H.W. Bush. Of the many to whom she’d made her pleas, “Dr. Sullivan was the only one who gave me an interview and really listened to me,” she says. Admitted to Morehouse’s two-year program, through that school’s partnerships she gained entry into Emory’s med school, and eventually its internships and residencies. By that time, she’d married and had a son and daughter – while interning at Grady Hospital. She and her husband, who had turned from law to investing, were already well-known in their community for their generosity and concern about the health and well-being of those who could not afford medical care. In 1999, after she had escaped violent conflicts around the world, tragedy arrived much closer to Harjee’s home. In a mundane Buckhead investment office, her husband was shot and killed, one of 22 victims of a shooting and murder spree by a man who would become known as the “Buckhead Day Trader.” Dean Delawalla died just a few hours before his daughter’s fourth birthday party. She was not yet finished overcoming. She says high-definition digital mammograms helped catch her breast cancer early. After surgery and chemotherapy, she has remained cancer-free for three years. Now she and her staff are in the process of electronically converting all their patients’ files. From her computer tablet, she should be able to read a complete history and scrutinize test results from anywhere. She helps educate her patients on the uniquely American risks they face, including diabetes (afflicting fully half her patients) and heart disease. With the help of other physicians and technicians, she provides care for uninsured DeKalb citizens at DeKalb Medical Center one day a month and operates a free clinic from her office two days a year. There was a time when the path to a college presidency in Georgia was well marked by familiar guideposts like academic achievement, administrative experience and perhaps a few notable articles in the appropriate publications, all of this over a period of 30 or 40 years before the candidate might be ready for the highest campus post. But Dr. Valerie Hepburn took a more circuitous route to the job and completed it in far less time. Hepburn, president of the newly created College of Coastal Georgia (CCG) in Brunswick since 2009, has held 14 different jobs in the legislature, state agencies and politics – a field where it is easy to make more enemies than friends – and never really ever set her sights on being a college president. When reminded she is now the real president she has a typical Hepburn response. “I call myself the unpresident,” she says. “I’m probably a little less formal than most presidents might be.” In fact, when Hepburn encounters her students on a stroll around the campus, she quickly joins in the joshing, giving as good as she gets. Begun as Brunswick Junior College in 1961, the 193-acre campus and its mossy oaks sat quietly near the storied Marshes of Glynn, a short drive from the Atlantic Ocean, seemingly waiting for something to happen. In 2008, something did, as the school became the College of Coastal Georgia, and for the first time ever this part of Georgia had a four-year college presenting baccalaureate degrees, a significant development, Hepburn says. “This region of the state has one of the lowest levels of educational attainment in the state because there hasn’t been a four-year institution here,” she says. Since arriving a little more than two years ago, Hepburn has presided over record student enrollment and programs growth while forming economic development and learning partnerships with local businesses, highlighted by an agreement with a six-county regional joint development authority to attract new businesses and improve the workforce here. Under her leadership, the campus saw its first new building construction in more than 30 years, some 250,000 square feet of classroom and housing space. “And we just achieved one of the very highest passing rates on the nursing exams of anywhere in the country, with 98 percent of our graduates passing on the first go-around, which is pretty amazing,” Hepburn says. CCG’s enrollment continues to climb and now stands at more than 3,200, with rising numbers of students coming in from abroad and from the far corners of the U.S. Her tireless efforts for her college and her community have produced admirers like new friend Mildred Huie Wilcox, a St. Simons businesswoman and art patron who also serves on the board of the Georgia Chamber of Commerce. “She has very quickly become the spirit of the community,” Wilcox says. But the parents need not have worried. Today the 35-year-old Kelly is Senior Vice President for the Georgia Conservancy, an organization she represents in headline-grabbing negotiations on the most critical economic and social issues of the day, from power generators and the deepening of the Port of Savannah to Atlanta traffic congestion and the Tri-State Water Wars among Georgia, Alabama and Florida. 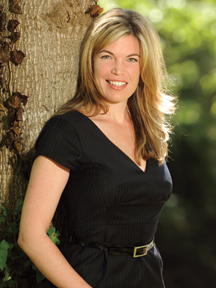 Kelly has made numerous published “success” and “watch” lists since emerging from the University of Georgia in 1997 and almost immediately going to work in Washington, D.C., as a legislative assistant – read lobbyist – for giant cargo carrier UPS, sitting at the table with foreign representatives and state department officials negotiating flight rates. “D.C. is a vibrant city and a fun place for young people interested in politics,” Kelly says. “But I also wanted to see if I could find a position in the nonprofit world.” She did, with another easily recognized name – Rockefeller. As a project coordinator for the Rockefeller Family Fund, she helped organize a statewide project to educate families and communities on the cause and effect of air pollution. Then she founded and ran Georgia Watch, a consumer watchdog organization that led the fight against payday lenders and advocated, with public health officials and other partners, for improved patient safety. Kelly has long been a familiar face in the halls of the capitol and the waiting rooms of state agencies, particularly those that regulate laws and practices involving the environment. She believes the most serious threat to Georgia’s environment isn’t in the air or water, it’s in plans, or lack of them, for the future. “It’s in the unwillingness to plan carefully and thoughtfully for the future, because growth is still going to come here,” she says. “If we want to continue to attract families and strong businesses to the state and its metropolitan areas, we have to provide the most important ingredients for a healthy lifestyle, and I’m not talking about cholesterol. I’m talking about good schools, safe drinking water and clean air.” In addition to her environmental and civic advocacy, Kelly devotes time to consumer and arts organizations. She is also a marathoner and half-marathoner.